As big of a fan as I am of colour blocking, I have, for whatever reason, tended to combine the same colours over and over again in the past. In celebration of Valentine’s Day last week (and this video created with the girls of The Style Common), I wanted to put together a festive but not overtly themed look… and matching the typical red with an unexpected plum hue just felt right. What are your favourite colours to wear together? I really love your outfit! I tend to be very conscious of the color red around Valentine’s day, but you’ve done it perfectly. The plum goes so well! This is such an unexpected but gorgeous combo! I love the pop of red with the plum! Definitely an original and understated approach to Valentine’s Day – well done! And really loving the cape & pants! xo! 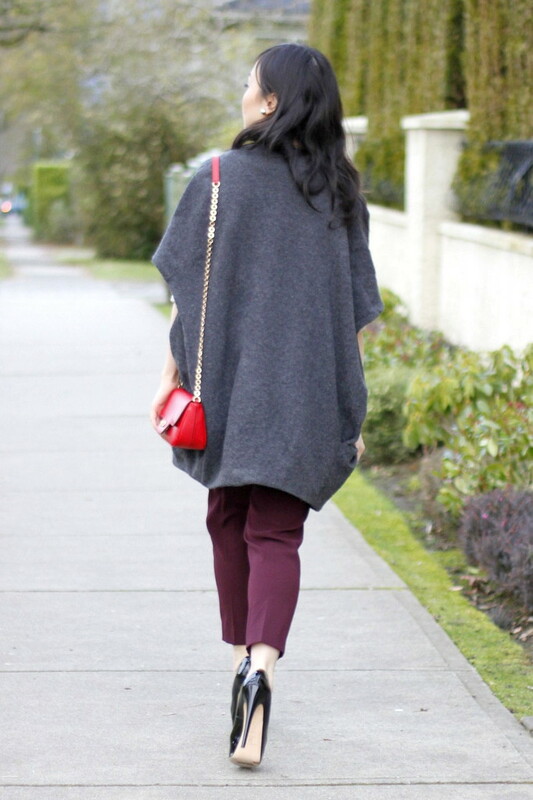 Love the layering and I’m convinced I need a cape! Would love to hear your thoughts on my latest if you get a chance! you look so chic, love this outfit. So cute. Love those plum pants. Two beautiful colors! Those pants are so gorgeous! Love the layering!! That feather vest adds the perfect touch! Amazing outfit! I’m definitely loving the wine or burgundy colour this season. I usually pair it with black, but I think I’m definitely going to try the grey or maybe even cognac brown! Very chic! Love the way you always come up with very elegant and sophisticated color combos. So chic! My favorite pairing would have to be navy and cream or cream and cognac! Love all these colors together! 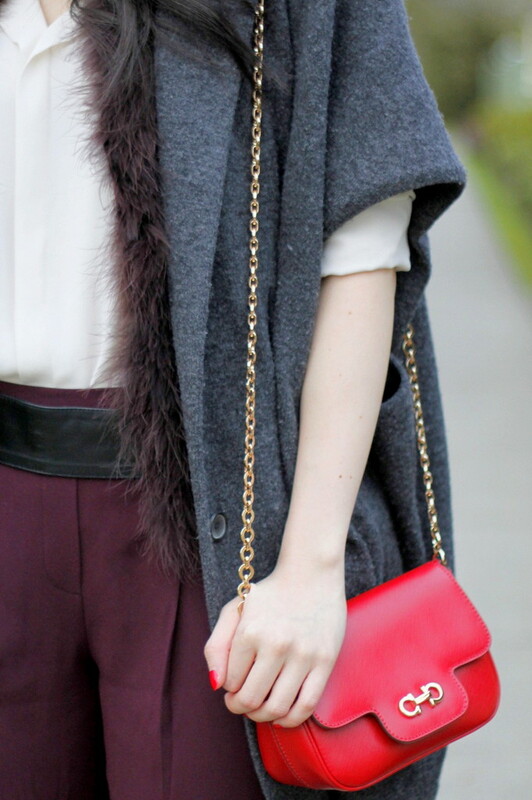 Gray and plum looks so good together and the red gives a really nice touch to the look! You look absolutely stunning Jen! The grey wrap sweater is gorgeous, and I love the shade of those pants! Cute look. Love your trousers!